Every other year our guild is making an opportunity quilt – sorta like a raffle quilt – for the guild. Our current one will be drawn for in a few more weeks. Here is our current guild opportunity quilt that is just about out the door! We used Tula Pink’s Modern quilt blocks in greys and blues. Bordered in green to help get the blocks to the correct size, and then grey sashing with subtly darker cornerstones. We were making these blocks from our own guild’s stash, and it turned out great because there is such variety in the colors used. We did this with expressed permission from Tula Pink, and specific instructions for guild members with the patterns involved. Which makes sense for the designer to protect their own copyright. Somehow for the next opportunity quilt, we were having a guild discussion and, sorta because I through out a question or two, I sorta attached my name out there for designing/picking the next one we do as a guild. We won’t have to have the quilt fully made until like January or February of 2019, but I am trying to think early, think ahead on this. Something about this project was nagging me. I spent a good chunk of time looking through quilt block books, scrap quilt books, this year. I have been spending time flipping through my quilt-block calendar. I usually flip through this and leave it up on a block that I would like to make, like the one in the picture above. I went through lots of designs on electric quilt 7 and just spent time thinking and thinking and planning and planning. I printed out several different types of quilts that would be fun to do. I had some time away from my computer and away from Electric quilt. During the times I was away, I used my book of 1000 quilt blocks, and my calendar and started sketching by hand on my moleskin, and used my good coloring pencils for some design inspirations. A few days I couldn’t find my moleskin and I used this sketchbook to get a generic idea for other blocks. As you can see, I like the grid work already done, everything is much better attended to. Something about this block drawing and coloring is very soothing. I think some of these would be nice to add into Electric Quilt and then explore some other color ranges. I also think I zeroed in on some designs that won’t work well with a mixed group, but will work better as a non-scrappy quilt, that I am saving for myself. Tell me a better way to start and desire to make many many more quilt starts?! I was attempting to figure out what blocks would be interesting enough that one would want to purchase a chance at, but also easy enough to have people work towards the quilt together, that will work as things with their stash. I kept coming back to a quilt design that I had done a while ago. That I had altered a while ago. 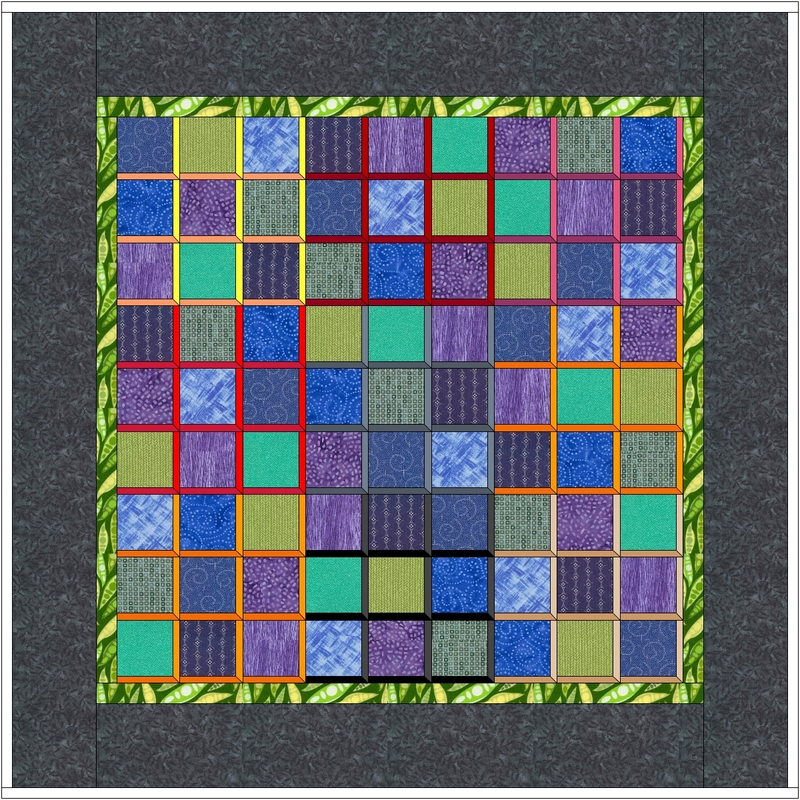 A quilt block called Aunt Sukey’s Choice. Over and over, I saw this design and kept thinking it would work! I was able to make one block for the quilt, and I even showed it off to the guild. A guild member had a good suggestion about the middle portion being one piece instead of four smaller pieces and reworking the white sections nearby. I like this idea and it will help simplify the quilt a bit. I tend to work in “cool color pallets” or “warm color pallets” when doing scrappy quilts. I ended up reworking this quilt a little bit after showing it off to the guild. The one I had shown to the guild was just blue and green alternating. I was leaning towards cool colors anyway. But If I think of this quilt block as a sort of “nine patch”, the half square triangle sections could look just as good in reverse as they do pointed out. And alternating reverse blocks with non reverse blocks would be good design in and out and have a good direction to the the quilt. So this is my rework of this design, which, for the moment, I am calling Sukey’s Reverse. I am going to write up directions to the quilt, This is the same block but with different colors and a reverse section next to a non-reverse section. Nothing harder than what was already done. I am giving myself the option to use a small amount of sashing that could fit in between blocks with dark blue cornerstones if the quilt blocks are not squared up correctly. A suggestion has been to get members to upsize the blocks and then cut down to the correct size before putting together. 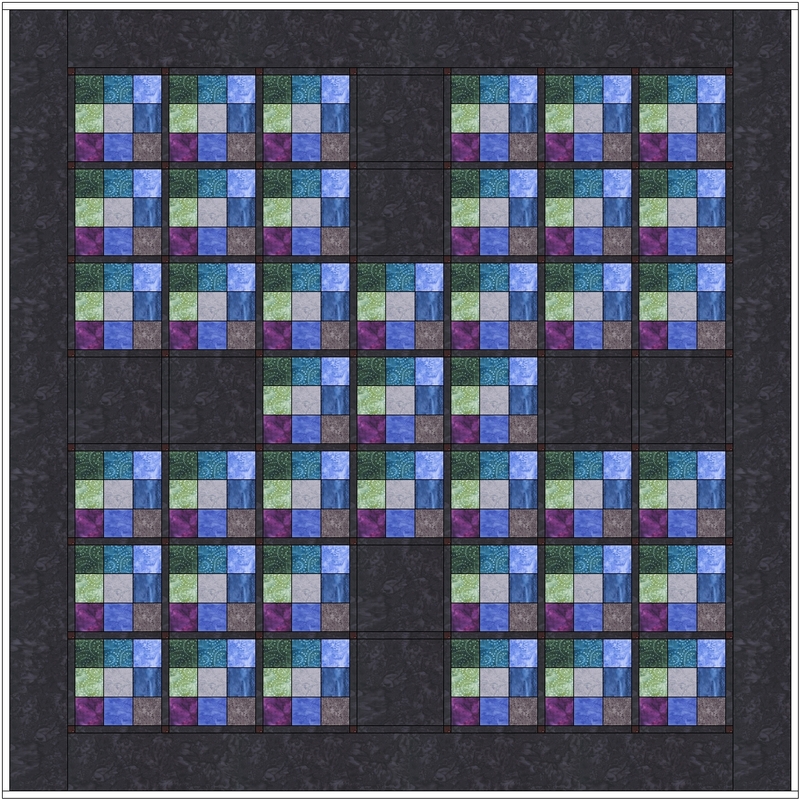 Also we could assign the half square triangle blocks to someone, and the four patch blocks to someone, and we could cover the various amounts of skill needed for the quilt. If we’re smart, we can do this out of our stash. I kept getting told to use a block or pattern that was either free or get permission to buy the book. And depending on my pattern writing skills, my guild members may ALL agree in the end. But this is what I wanted to do from the outset, take something familiar and then make something new with it. If this pattern is already out there and possibly popular, please let me know, but this was something I truly created from a block pattern and a good design program. I am liking the blues on all the outside blocks, and the other colors on all the inside blocks I think this will ground the quilt but also have a nice variety of colors and interest and fabrics! Hey all! I have been trying a few things, but today during my day off I have gotten more done of the same quilts I have been working on. First I am working on adding more corners to the Winslow Corners quilt. I have 5 more blocks of pieces done of the corner pieces, but not trimmed up & sewn together yet. Trying to decide on this quilt size. Most likely this will be another throw quilt. Looking forward to trying something cool in the light grey section for the actual quilting of these blocks! I also have to go back to EQ and print/create the border blocks which finish up the corner pattern. I am finding it a nice way to use my scraps. 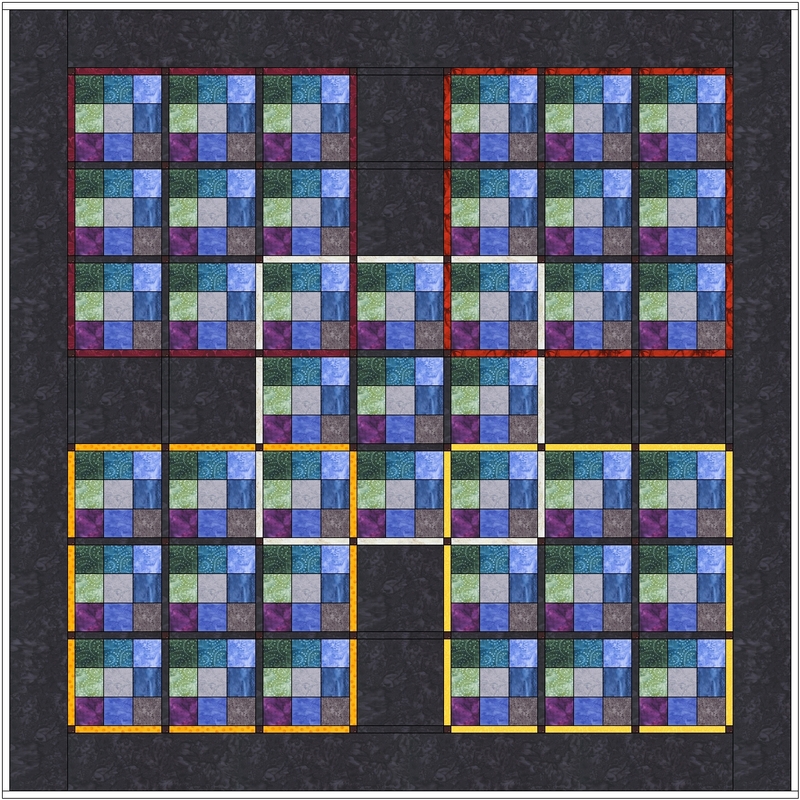 I may look at other patterns that have 16 patch blocks in them. I have been thinking about sashing them in colors or black and setting a different alternating block with them. I have also been doing more of the same scrap quilting with Shoo Fly blocks. I have one more block hanging out on the sewing machine, and i have pieces for many more blocks, maybe another 15 – 20 blocks already done. It makes it easier to get started sewing when I know the decision has been made and the prepwork has been done on these blocks. I do want to do a disappearing Shoo Fly block quilt. I am now not certain THIS is the quilt to do that to, considering each of these 9 patch blocks are only 3″. To cut them down and resew them I would lose several inches and it might not be big enough to appreciate the design. Or the time it will take to cut apart and resew these blocks. I haven’t decided yes or no on that yet. Still making the pre-made shoo fly blocks. I did sort all my pieces of scraps by color for 1.5″ blocks in anticipation of a potential swap in the future. I also have sorta swapped with someone some of these 1.5″ blocks. And I may have signed up for a hashtag swap for the secret Facebook group “Twilters!” Due in October. I have a lot of random strings that may make nice hashtag pieces. 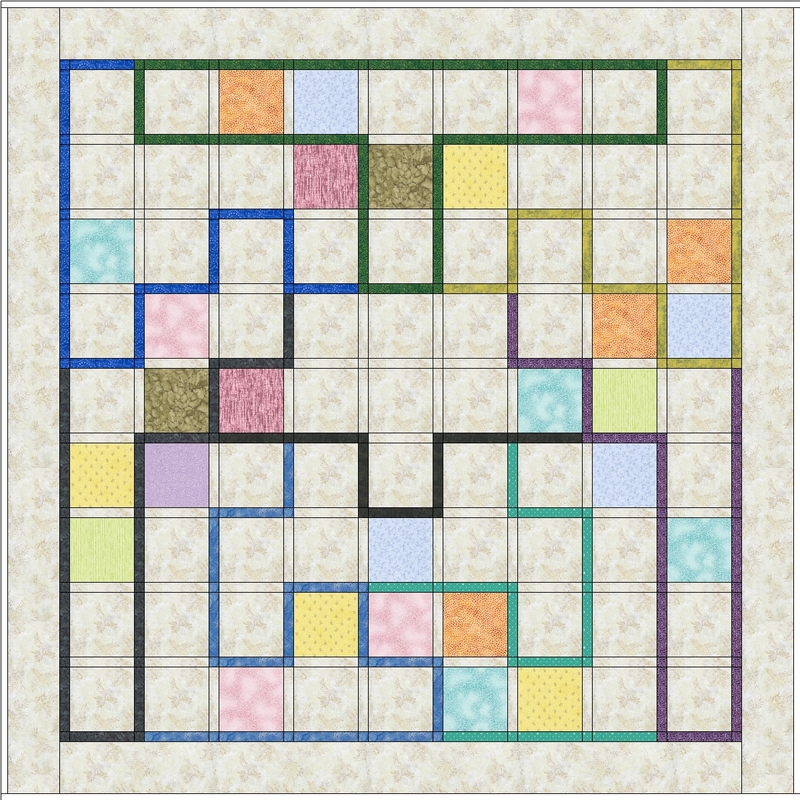 I am leaning towards taking apart my quilting on the Samurai Sudoku quilt that is so off kilter on the quilting. I currently only have 3 hours of quilting into the top and its about a 1/4 way quilted. I have to set up an appointment to go back to the long arm quilting place in October and I have been hemming & hawing trying to decide to take out stitches or not. The thing is pretty wonky, which causes me to be uncertain I would like it if I continued quilting as I have been. Knowing me, I would worry & about it if I didn’t fix it. I have told myself it is practice. But I want it to be better practice than this. But it is so much work to do and then I have to go redo all the quilting on it already. So mostly more of the same quilting as the last month. I someday will go back to other UFO’s I think. Debating on weather or not to do Scrapitude this year. I don’t really like the timing of it (early in the year or maybe it’s late near the holiday season). I haven’t decided. Seems like a few things going on now. And then I have been doing these “new projects” such as Winslow Corners quilt. As I was cleaning my sewing room, I found Winding Ways small scrappy quilt blocks that I swapped with the swap group I was in. We used the Accuquilt cutter to cut random batiks, and I don’t mind sewing the blocks together yet. For yet another donation/extra scrappy quilt. I have decided I would like to attempt a Jack’s chain quilt for the next big Regional quilt Festival here, in 2017. Might be more than I can chew in just under 2 years. But these 1.5 inch pieces could be useful for that. First I need to figure out how to make EQ7 do what I want. I posted on an EQ7 FB group and got some good advice, but still am stuck, since the copy paste instructions I got somehow aren’t pasting correctly doing it the way that it was suggested to me. I don’t think the instructions are wrong, but I do know it’s not doing what I want it to do, so maybe a different route will be necessary. Or maybe I have to click somewhere else first. EQ7 is picky like that. I have a vision or actually several ideas for the quilt. But need an EQ7 color guide for me to be successful at it! We will see if I change my mind before the event. I have had a few months of batting the idea around already and so I know it will be one I will like to try to put into that show. Very time consuming quilt, depending on size. You ever heard of a Sudoku quilt before? Sudoku is a puzzle game, much in the style of magic square type of math game. Each section of the Sudoku puzzle is it’s own little nine patch, (a 3 x 3 grid) with each box of the nine patch has a number from 1 to 9 in it. 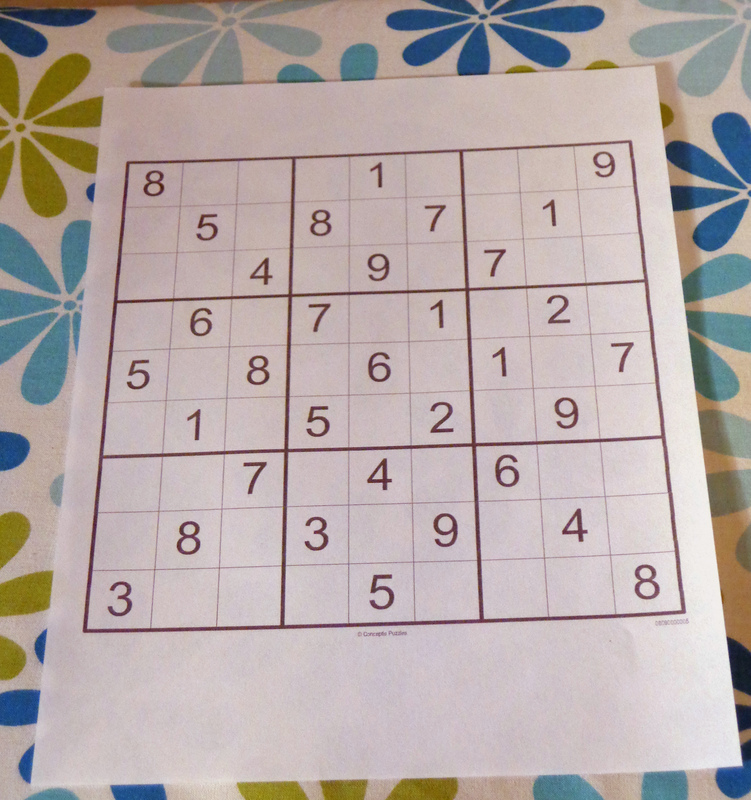 There are traditionally nine sections in a Sudoku puzzle, each section is laid out in it’s own nine patch box. A 3 x 3 grid of sections. Traditionally, the rule for the puzzle is as follows. Each box in each section has a number 1-9, with no repeats. Each box in each row (of three sections) has a number 1-9, with no repeats. Each box in each column (of three sections) has a number 1-9, with no repeats. 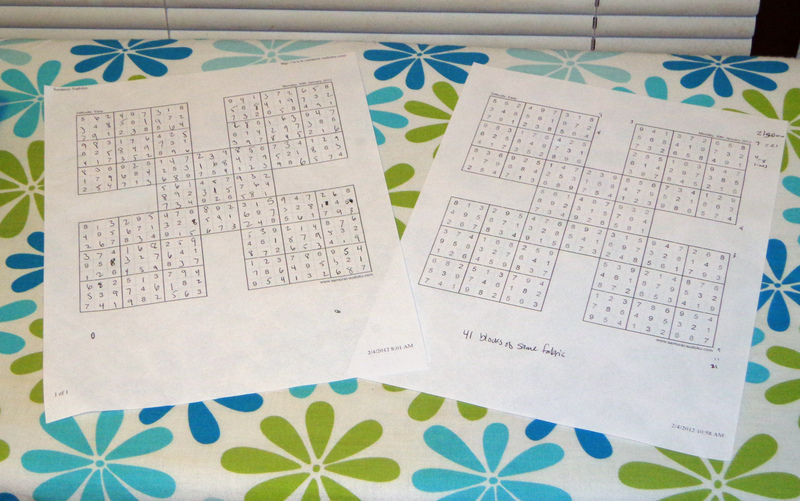 Here is a picture of a printed Sudoku puzzle that is not filled out. You can see some designs in how and which numbers are included with the puzzle as well. Well, a while ago, some quilter got it in his/her head that we could use these puzzles easily in quilts. Quilts are squares, Sudoku puzzles are squares, nine patches look like Sudoku boxes. And I’ve seen a couple of people use fabric or colors to symbolize each number. 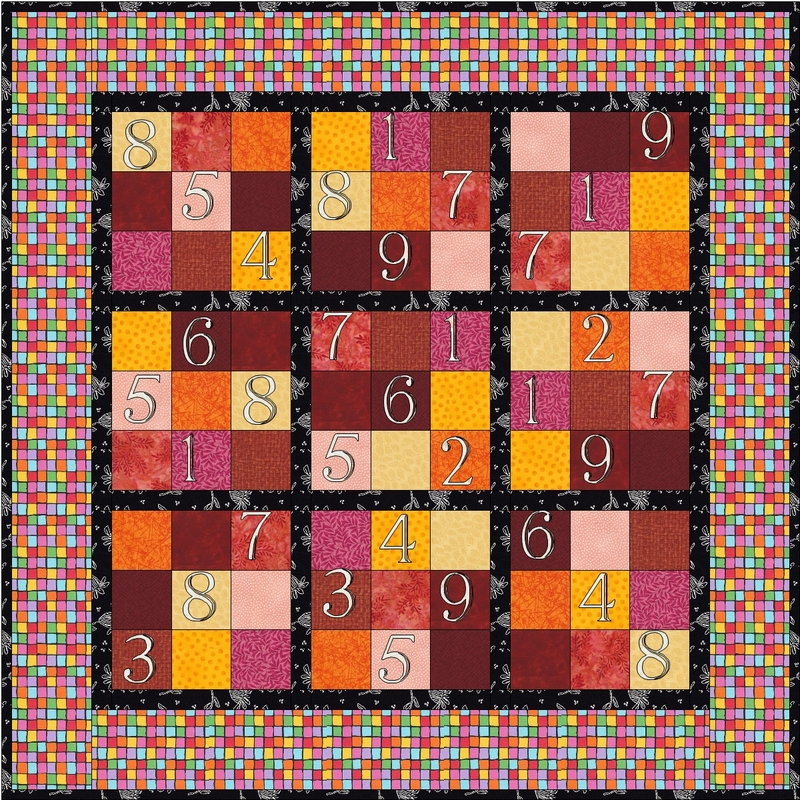 If each of the numbers is represented by a specific color OR a specific fabric, then this turns into a very easy (just have a design wall) quilt to make. Straight stitches, nine patches. You can include sashing around the nine patches to signify the darker lines. 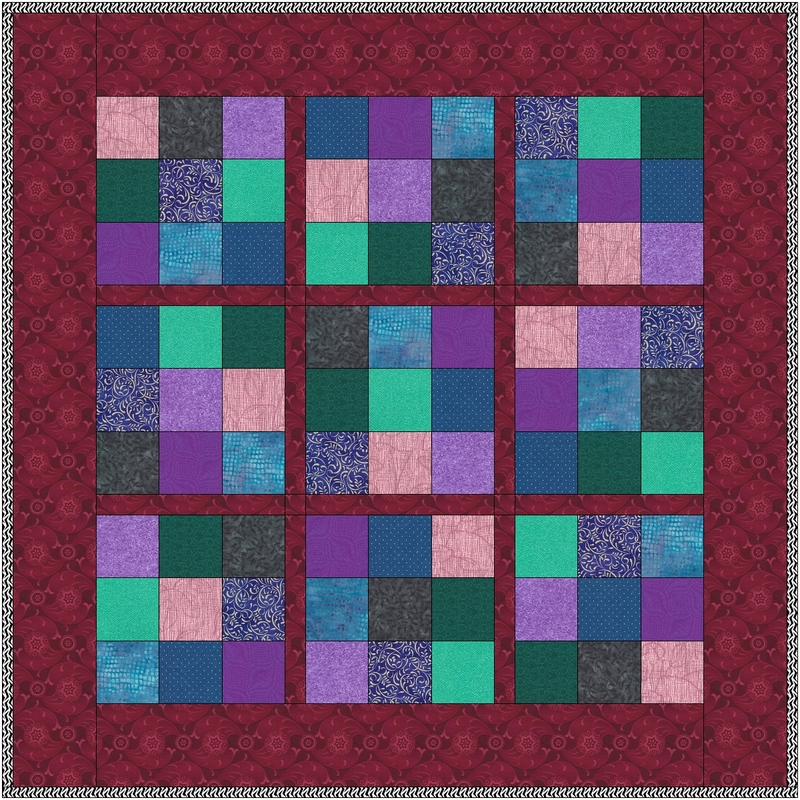 This quilt takes 9 of the same colors or fabrics, so you may be able to use 9 fat quarters or 9 fat eights to complete depending on the size of the quilt you want to make. And you should be able to find Sudoku quilt patterns to purchase if you do not want to actually do the puzzle yourself. Or ask your kids (or other recipient) to do the puzzle and then give it back to you completed, and then you make a surprise quilt, including the picture of the original puzzle on the back. If you wanted to be a little different, what about setting the Sudoku quilt patches in attic windows to designate the quilt blocks? Don’t want to do the whole puzzle? Just make the starting numbers and leave the rest blank! Or go ahead and give them the actual numbers using applique with the method of your choice. Here’s a link to 21 different ideas with Sudoku quilts and art! Samurai Sudoku is a set of 5 Sudoku puzzles superimposed onto each other. There are 5 puzzles next to each other that overlap in four areas. The image below I haven’t put the time into getting the correct colors into the correct locations, but this is just an image that shows how the Samurai Sudoku quilt would appear. 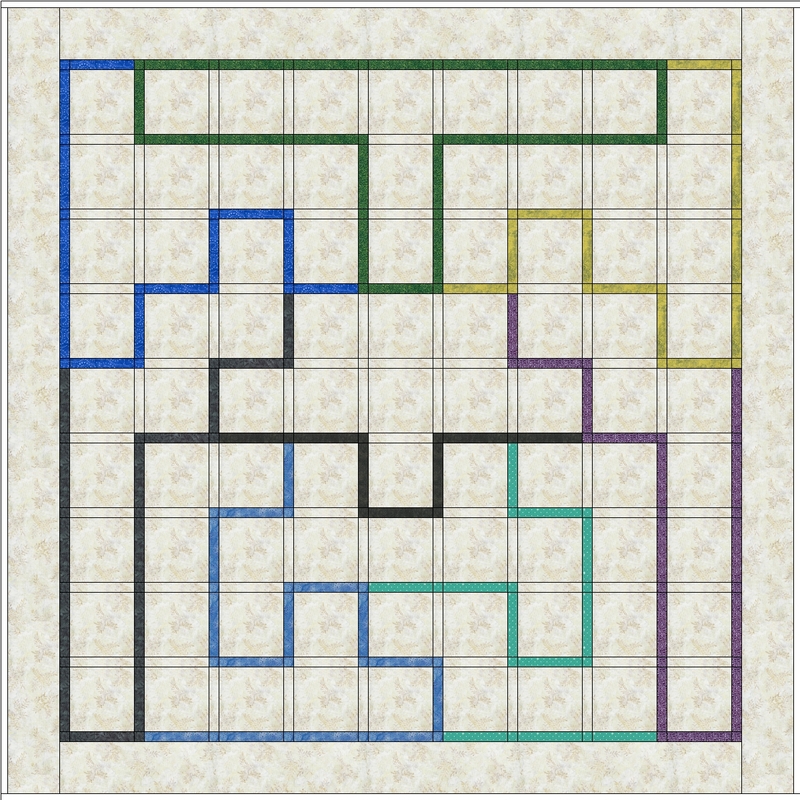 If you’re having a hard time finding the overlapping sections, you could always use sashing colors to designate the different puzzles. To get your own puzzle, you can look at samurai-sudoku.com Just look through the archive until you find an easy pattern and try it on your own. You can always download the solutions. Also another good Sudoku reference for puzzles of all kinds (including the original and the next ones) that you can print the incomplete puzzle or the solution to the puzzle. For making a quilt of this kind, you need 41 of the same colors for the blocks for this quilt. 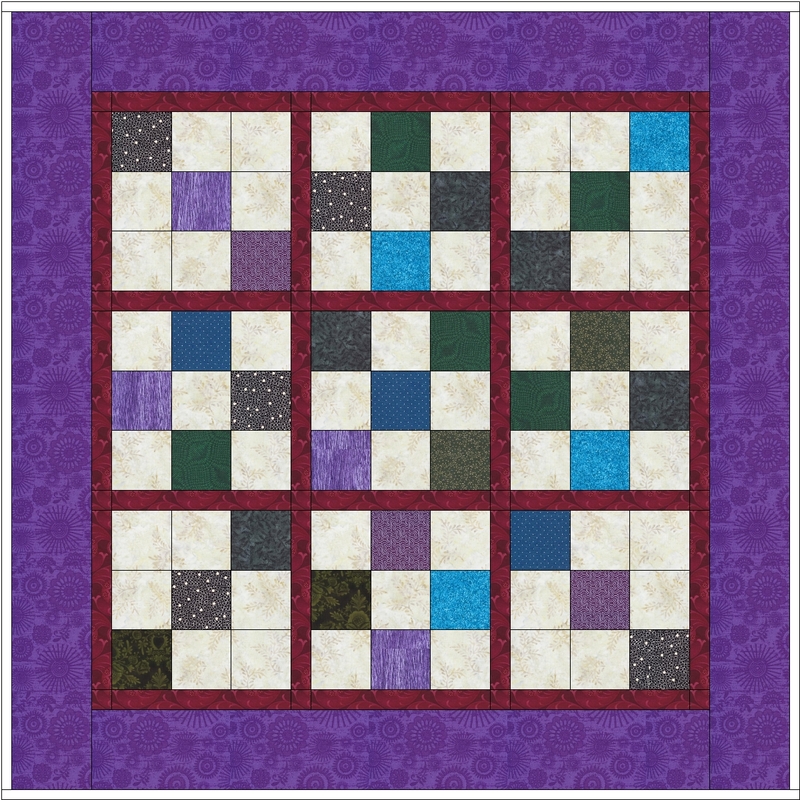 If we use 2 inches finished as the size of your squares inside the block, then the quilt pictured above is 55 by 55, or if you use charm pack sized squares 4 inch finished square then the quilt can be 97 inches square. It’s easier to upsize and downsize this quilt since it’s so simple! Nonomino puzzle is like Sudoku in that there are still rules of Sudoku, such as only one of each number for each row, and then one of each number for each column. The difference is that instead of a ‘nine patch block’ shape, the blocks are irregular shaped. There are still 1-9 numbers in each block that don’t repeat. Here is a nonomino puzzle with sashing designating the different groups available for sets of numbers 1-9. Here’s a general sudoku puzzle site that has many variations of sudoku including nonomino and samurai styles of sudoku to try, print, and save. Like Puzzles, Like Quilts? Send people back to this post and this podcast. You are currently browsing the archives for the EQ7 category.